Set you mind free by visiting Cappadocia’s imposing sights and admire what nature can create. 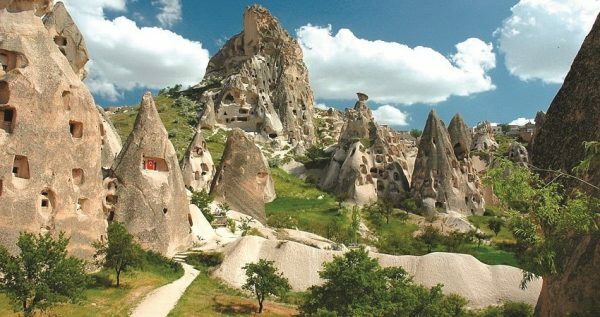 Cappadocia Red Tour is what you are searching for if you want to visit these stunning multi-colour canyons that are full of caves and underground cities. A one of a kind volcanic rock landscape and many other activities is what you should expect from this tour. 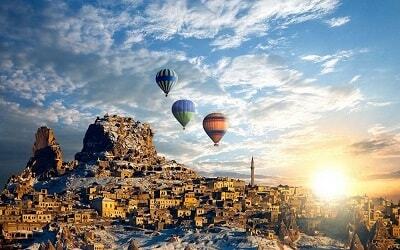 Cappadocia will impress you as it hosts the ideal location for indoor and outdoor activities. 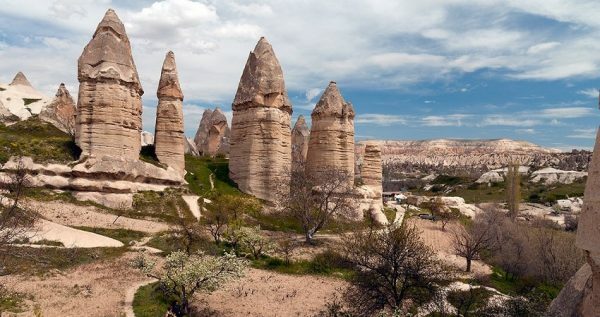 Get the chance to experience the fairy-land and snap some amazing photos by participating in this full-day Cappadocia Red Tour. Cappadocia Red Tour starts in the morning when a comfortable, fully air-conditioned and modern bus will pick you up from your hotel. The driver along with your guide will drive you towards the first stop of this amazing tour, which is Uchisar Castle. Just before reaching the area, the professional and experienced guide will provide interesting information regarding the history and the importance of this rock castle. 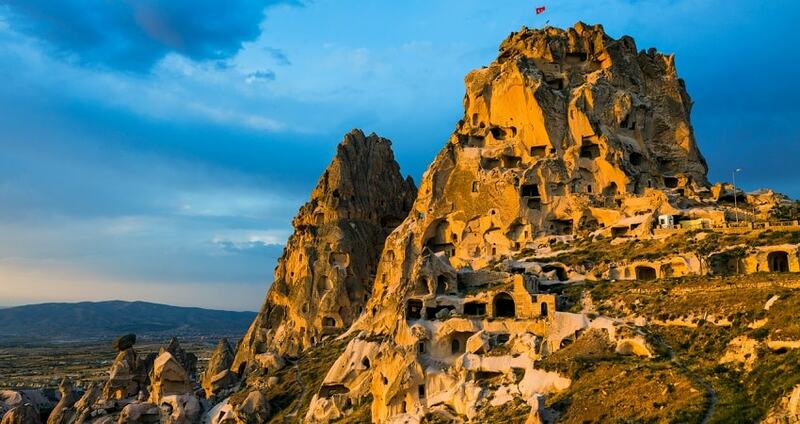 Your first impression will be excellent as this area is the highest rock formation in Cappadocia. 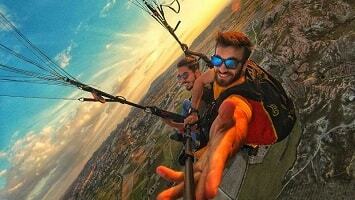 During your short break, you can enjoy excellent panoramic views over Cappadocia and snap some breath-taking photos. 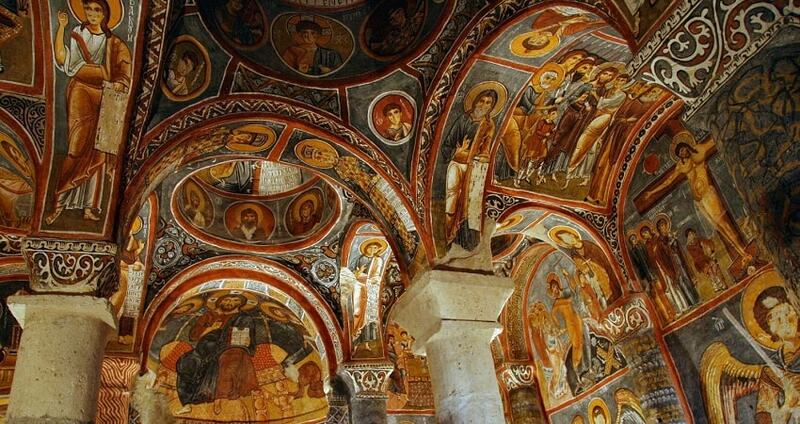 The excursion continues towards the second stop which the infamous Goreme Open Air Museum. 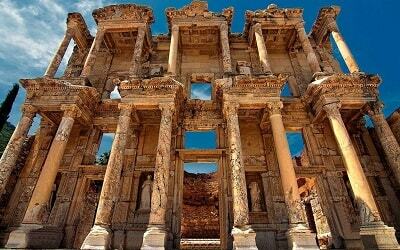 This impressive open air museum is definitely worth visiting since it is part of the Unesco’s World Heritage List since 1985.You will have the chance to spend some time there and admire the imposing surroundings. More precisely, the open air museum consists of churches that are built into rocks and carved chapels that date back to the early-Christian period. In addition, there is a monastery that back then was serving as an escape emergency resort in case of Roman invasions. 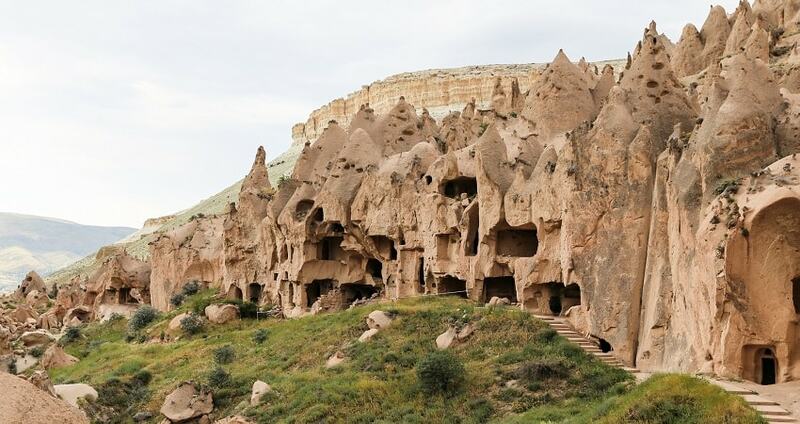 In Goreme Open Air Museum you will be impressed not only from the setting and the architectural style. In fact, interior design will also impress you. 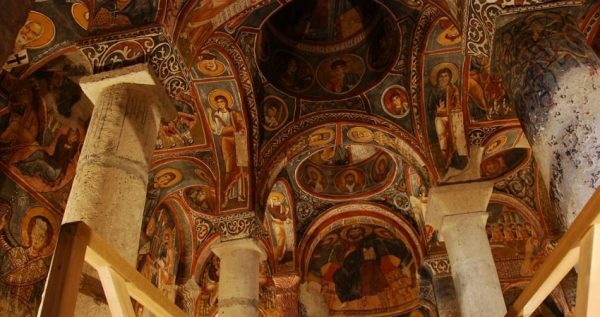 Very well preserved frescoes can be seen inside the churches that trace their origins back in the 5th century. Your guide will explain everything you need to know about the area and answer the questions you might have. You will have free time in Goreme Open Air Museum for an hour. Your next stop is scheduled to be made at the Love Valley to take panaromic pictures of the valley. Cappadocia Red Tour continues with a visit at the Pasabagi Valley. The valley is the ideal place to observe and admire fairy chimneys and snap some pretty nice photos. It is also known as Monks Valley due to a small church that is dedicated to Saint Simeon and is situated in one of the three chimneys. The hermits that used to live there were inspired by his life and created isolation rooms inside the fairy chimneys. The Valley creates one-of-a-kind imposing scenery as you can understand Cappadocia’s formation. What follows is a lunch break at a traditional Turkish restaurant. You will have the chance to enjoy a buffet lunch that includes a variety of tasty and freshly made options. Energized and relaxed, you will then return to the bus as your tour continues towards Avanos. The area was forming the main point of terracotta arts since 2000 B.C in Hittite times. 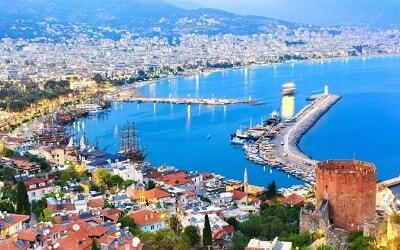 This small city was constructed right next to Turkey’s longest river, namely the Red River. People of Avanos took advantage of the area’s resources and became magnificent potters with unique creative skills. This tradition and art is still alive there and during your excursion you will visit a traditional workshop. The potter will demonstrate in a step by step procedure how to produce terracotta pottery. At the workshop you can also preview the amazing collections of products and you can purchase some great souvenirs. The bus will then continue towards Devrent or Imagine Valley. This particular area is known for the rocks that are having an unusual formation. More precisely, the rocks that can be found in Devrent Valley often resemble the shapes of animals such as dolphins, snakes and seals. The most outstanding and famous rock is the one that resembles a camel. During your time in the valley you will surely have to put your imagination into work. Cappadocia Red Tour continues with a last stop in Urgup. 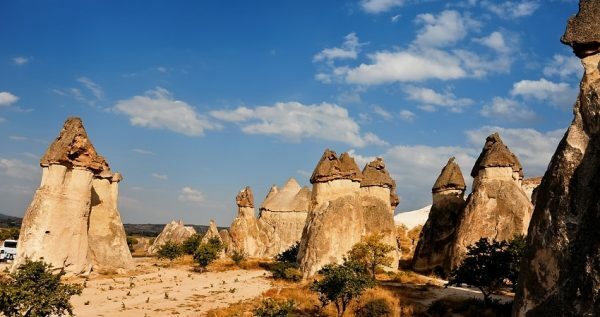 There you can observe a unique rock formation that is the symbol of Cappadocia. The excursion ends by the time you reach your hotel. Filled with beautiful images of unique places, your memories from Cappadocia Red Tour will last for a long time. Cappadocia Green Tour can be another adventurous day in Cappadocia. Spend a day in Cappadocia and experience the infamous Red Tour that can get you to the magnificent and world-wide famous fairy chimneys. This excursion combines sightseeing with spectacular sceneries. Except from the imposing rocks of the area, you will also get the chance to immerse yourself into the folklore tradition by visiting a pottery workshop and a carpet factory. 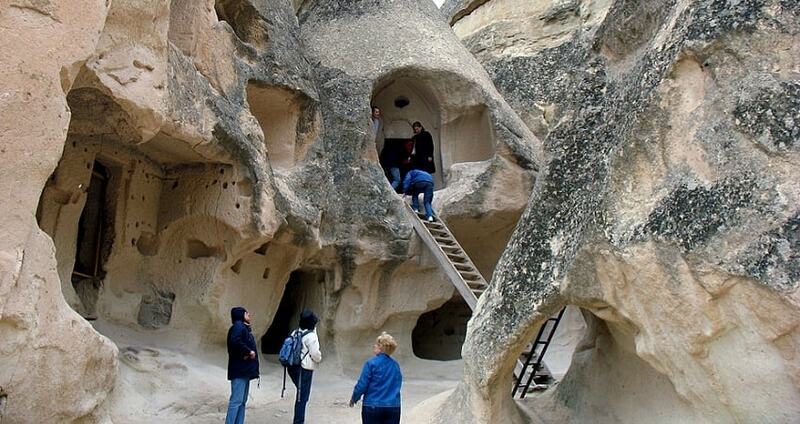 Cappadocia Red Tour excursion is an all-in-one experience not to be missed. During the morning a comfortable and modern bus will pick you up from your hotel. Accompanied by your tour guide, you will be driven towards your first stop which is Uçhisar Castle. Uçhisar Castle forms the highest rock formation in Cappadocia. You will enjoy stunning panoramic views of the surroundings, as the guide will provide a detailed description of the history and the importance of this imposing rock castle. Make sure that you will take some beautiful panoramic photos during your time there. 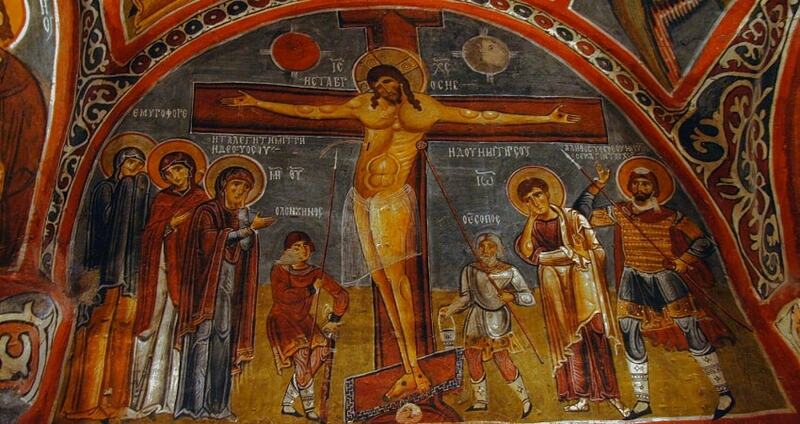 The excursion continues towards the second stop which the Goreme Open Air Museum. This impressive open air museum is included in Unesco’s World Heritage List due to its historical importance. The area forms an important spot of the early-Christianity period as it includes churches that are built into rocks and carved chapels. 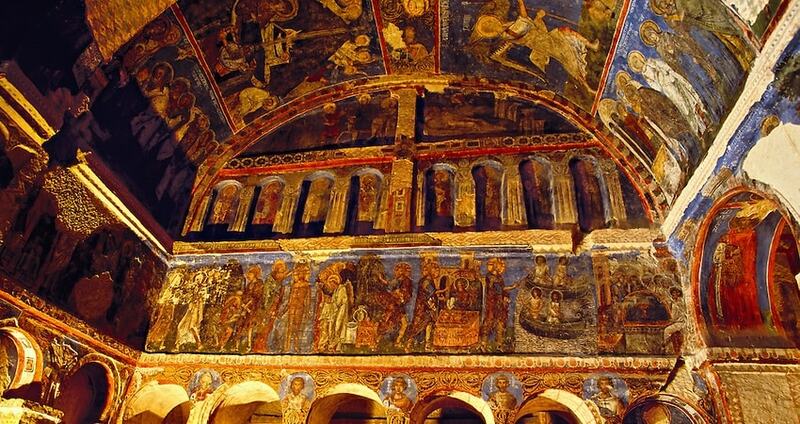 In addition, there is a monastery that back then was serving as an escape emergency resort in case of Roman invasions. Within the churches visitors are able to observe well preserved frescoes from the 5th century. The guide will let you know some interesting facts about the area’s history and importance as you will be walking through the imposing sights. Cappadocia Red Tour continues with a visit at the Pasabagi Valley. The valley is the ideal place to observe and admire three fairy chimneys. It is also known as Monks Valley due to a small church that is dedicated to Saint Simeon. This chapel is carved into one fairy chimney. The hermits that used to live there were inspired by St. Simeon’s life and created isolation rooms inside the fairy chimneys, 10 and 15 meters high. The Valley creates one-of-a-kind imposing scenery due to its unique formation. After that a lunch break follows at a traditional Turkish restaurant. You will have the chance to enjoy an open buffet that includes a variety of tasty and freshly made options for all tastes. Energized and relaxed from your break, you will continue your excursion continues towards Avanos. The area forms the center of terracotta arts since 2000 B.C in Hittite times. 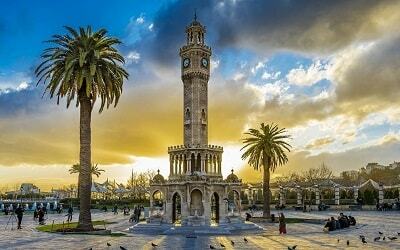 This small city was constructed right next to Turkey’s longest river, namely the Red River. People of Avanos took advantage of the area’s resources and became potters with unique creative skills from generations to generations. Pottery art is still alive in Avanos and during your excursion you will get the chance to visit a traditional pottery workshop. The potter will demonstrate the traditional pottery procedure and you will have the chance to participate in the making process. There, you can view several pottery products and purchase some souvenirs. The bus will then continue towards the Devrent or Imagine Valley. This valley is known for the rocks that are having an unusual and unique formation. The rocks in Devrent Valley often resemble the shapes of several animals such as dolphins, snakes and seals. The most famous rock that can be found there is the one that resembles a huge camel. Cappadocia Red Tour continues with a last stop in Urgup. At that particular area you can observe a unique rock formation that is the symbol of Cappadocia. The guide will provide a detailed description of the symbol and its importance. The fairy chimneys in Urgup will impress you due to their imposing style and the atmosphere that create. This magnificent and inspiring excursion ends by the time you reach your hotel. Your memories from this excursion will be definitely long-lasting.